This Prayer Hands logo sign measures 12" diameter circle. Ideal to mount on the wall, your window, any church furniture, podium, communion table. Or decorate an office, living room, classroom etc. Used quality frosted one side acrylic. Laser etched image. Material thickness is 1/8" (3mm). Let this sign be your constant reminder of Chris and the Cross, let this sign be your light for the day. Three round stickers are included to make mounting to smooth flat surface easier free of charge. 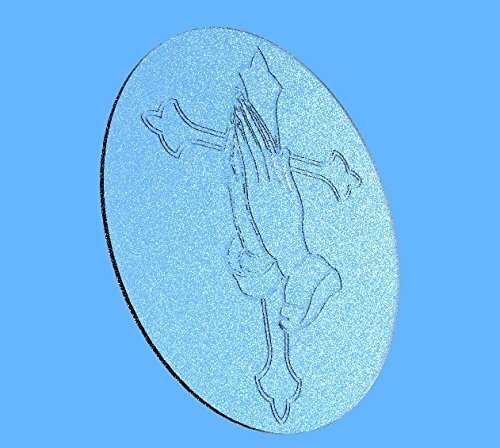 This listing is for the round prayer hand plaque only. Podiums illustrated demonstrates possibilities of using this plaque. Podiums are NOT part of the listing. They are available for purchase in Fixture Displays store under Podiums category.